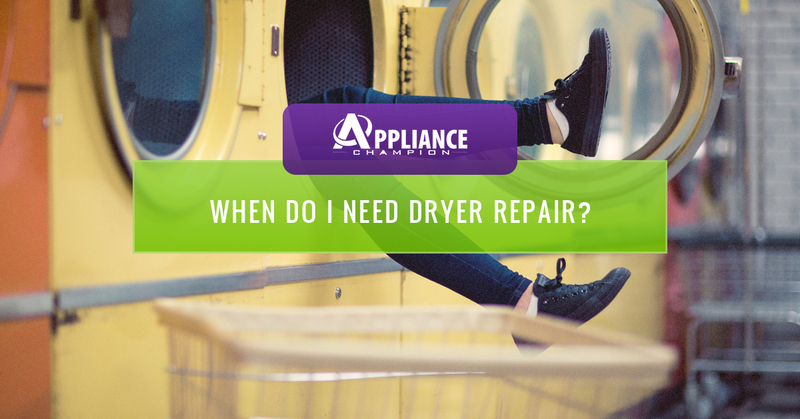 When Do I Need Dryer Repair? One of the best things about living in the twenty-first century is having the ability to have results right away and one of the main ways that we get this convenience is through our appliances. Our dryers give us the ability to have warm, clean clothes no matter how long ago we did laundry. It allows us to shrink those clothes that are a little too big or to return those clothing items that have stretched out back to their original form. We could survive without our dryers but why would we want to? If you’re wondering if you should call for dryer repair, keep reading or contact the caring staff of Appliance Champion! We would love to help you have a dryer that you can rely on now and for years to come. If you are concerned about losing your dryer, never fear! For the signs that it needs repair will be pretty obvious. Like all of our appliances, you get used to how your dryer runs and so you are the best judge, besides the pro, as to when your dryer seems to be a little sick and in need of some TLC. The only thing that should be tumbling in your home is your dryer and if it isn’t or isn’t tumbling like it used to, then it may be time to call your local dryer repair experts. Tumbling helps your clothes to dry properly and to dry without wrinkles. If your dryer isn’t tumbling, a quick fix will most likely solve the issue, but don’t wait to call your dryer repair specialist! Getting this fixed as soon as possible is not only pertinent for the life of your dryer, but also because you deserve a fully-functional dryer. We’ve all been there. We have set the dryer cycle for the umpteenth time and our clothes still aren’t dry. If you must run your dryer several times more than normal to dry your clothes or you open your dryer right after the cycle is complete and your clothes aren’t warm to the touch, this may be a sign that your dryer needs some well-deserved maintenance and repair. However, do not panic right away if you run a load of laundry and it isn’t dry. Check the dryer setting you chose and try a different one, but if you have ran every cycle or you know that the particular cycle setting you choose usually works then you may need to call for dryer repair. A dryer without heat isn’t normal — get your’s fixed right away!. If you smell something burning, turn your dryer off immediately! There is a difference between that normal “heat” smell and that “something-is-on-fire” smell. If something is burning within your dryer, you must get it looked at by a dryer repair specialist right away before you use it again. Running it again can not only further damage your dryer, but also create a dangerous situation. Not only will you be putting yourself, family, and home in danger, but you will be putting that favorite outfit in harm’s way and that is not good at all. No one ever asked, “do you speak dryer?” because we all know that dryers don’t talk and that, in reality, your dryer should be a pleasant hum in the background. The only “odd” noise that your dryer should be making is the crank caused by buttons, snaps, zippers, or the misplaced chunk of change. If your dryer is making more noise than normal that is a clear cry for help. Call your dryer repair specialist when your dryer is making noises that should only be in horror films. Obviously, if your dryer won’t turn on, there’s a problem, but it might not be with your dryer. Before you panic, check to see if our dryer is plugged in. If it is plugged in, then check your breaker. If it is fully functional and there isn’t anything else wrong with your electrical system, then the problem most likely lies with your dryer. If your dryer is reluctant to turn on, check your owner’s manual or give Appliance Champion a call! We would love to give your dryer the TLC that it needs. Modern dryers provide us with so many conveniences. Not only are there so many more settings that can accomodate our drying needs, but our dryer can actually tell us what is wrong with it by displaying an error code. 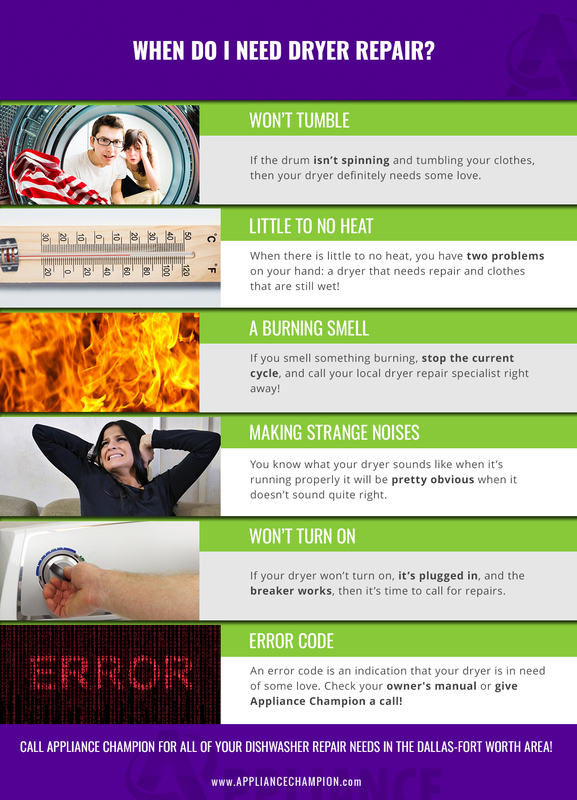 To see an error code on your dryer’s display can be disheartening, because who likes to see their dryer in distress? On the other hand, an error code can help us know exactly what is wrong with it and can save us time on the diagnosis process. If you have kept your owners manual, you can actually check it to see what an error code actually means, but if you’d rather, just give us a call and we can help you figure out what your dryer needs. Is your dryer making odd noises or smelling like burned rubber? Do not despair! Appliance Champion can help you figure out what is wrong with your dryer and get it up and running once again. 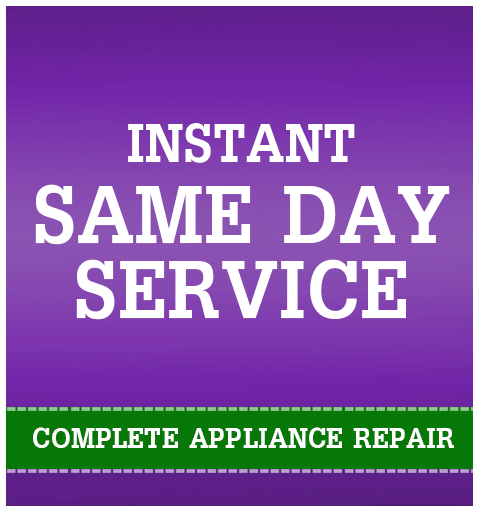 Because we understand how inconvenient it is to be without your dryer, we offer same-day dryer repair appointments and usually have access to brand-name repair parts so that we can fix your dryer with the parts that it needs. If you are concerned that your dryer isn’t running like it used to or it has completely quit working, give Appliance Champion a call! Our drug- and background-tested, factory-certified dryer repair techs always have your needs in mind and never leave a mess. No matter the issue, we will take the time to explain the issue, the fix, and the ongoing maintenance needed. Get $25 off your service appointment and five-star performance when you call Appliance Champion!